Last summer, Joseph Fuller came to work in the workshop. He has been an invaluable asset. In many ways, two are better than one. He comes from a Fine Art background, like I do, and has an astute and well-trained eye. He is also curious and conscientious, two important traits for any aspiring potter. We talk constantly about the development of DSP – how to refine it, define it and evolve it. Having Joseph in the workshop has allowed the space for this to happen. 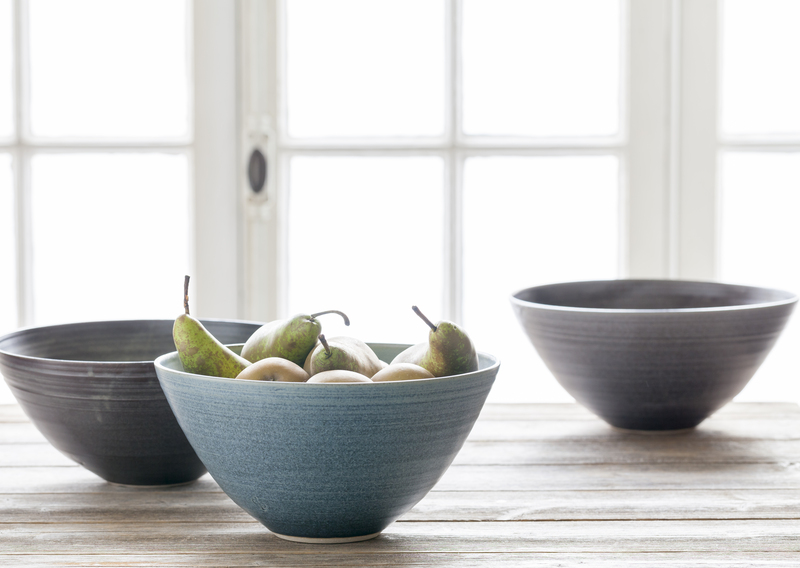 Before he came, I was throwing, glazing, wrapping, emailing, marketing, just about hanging in there – the normal state of affairs for a potter. This is fine but allows little time or space for the developmental aspect of the business, so fundamental to the vibrancy of a healthy pottery. I could concentrate on the standard pieces but little else. I was aware that this was the case but found I was unable to do much about it, an exceedingly frustrating experience. Now, Joseph takes care of the glazing (including glaze experiments) and packing, some admin, and much else. I can focus predominately on throwing, which, given the increased time, is, I hope, improving. Having two heads in the workshop all the time means that we talk regularly about how to take the business forward and we are in a much better position, now that he is here, to be able to make that happen. Two conversations I have had with other people have also been profound and affecting. One took place at a show last year and the other just last weekend. The show, for me, had been a curiously flat affair. We took reasonable sales, really fairly good sales, in fact, but during the show and after I felt oddly dissatisfied, yet was unable to pinpoint exactly why. Asked by one particular maker how it had gone, I replied that I thought that something had been missing. We discussed it further and then he said to me “Are you sure it was the show? Could it be something that you are doing?”. Something I am doing?! The cheek, I thought! The second conversation was with a fashion designer, who I enjoy talking to about his work. I asked him how things were going and he told me about how he had been designing products which would help him market his next collection. He spoke about needing special pieces, ‘key’ pieces, that call attention to the brand. When actually placing orders, shops usually take the basic range, plus a few extras, but you need the calling card pieces to give the brand personality and life. As I was listening to him, I was thinking about how this would translate to DSP. I think the comparison with a fashion brand is an apt and appropriate one – that model is a good one. We, too, have ‘basics’, these are the plates, bowls, mugs, beakers etc. – but, I feel, what has been missing from DSP are the ‘key’ pieces that bring the brand alive. The maker from the show had been absolutely right – there had been nothing wrong with the fair; quite the opposite, it was dynamic and vibrant. DSP has done the ‘basics’ reasonably well but, on reflection, that was really all there was, which after a while is only remotely interesting. That was the reason that the show felt flat. Putting these two conversations together has been totally enlightening and invigorating. A pottery needs ‘key’ pieces; it needs pots that grab people’s attention. But, like in the fashion industry, that attention needs to be regularly tweaked; maybe not seasonally, but it definitely needs tweaking and tweaking hard. So, Joseph and I have a resolution for this coming year: to add ambition and daring to the collection. Inspiration for writing posts on this blog often comes from books I have been reading; this post is no exception. 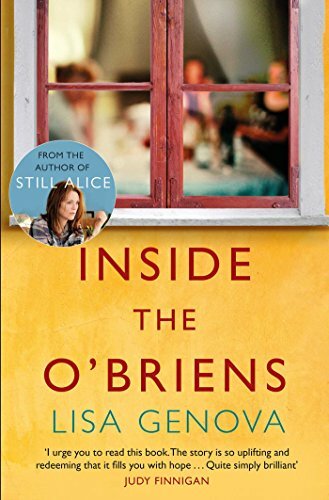 The book I have been reading is called Inside the O’Briens by Lisa Genova. I wonder how many of you have heard of it. Next year I will have been making pots for 5 years and I am really still towards the beginning of my making life. I have been utterly driven and single-minded from the start. This is partly because I have come at it quite late, aged 42 when I first touched clay, and feel like I don’t have a moment to lose. I have reached this point through a rather circuitous route, although there has been a strong creative bent throughout. I am finally in a place where that creativity has coalesced, and it feels good. A number of people have asked me along the way what the hurry is – this is partly it. It is also, though, partly related to the book that Lisa Genova has recently published. Genova used to work as a neuroscientist and is now a novelist. Her explicit intention for becoming a writer instead of remaining a scientist is the raising awareness of neurological diseases. Genova has spoken of the fact that as a novelist she can reach and affect millions of people. Her first book, called Still Alice, made into a popular film, was about a woman with Alzheimer’s. Her second book, Inside the O’Briens, is about a man with Huntington’s Disease. As a scientist, Genova comes at it from a factual perspective, which she weaves her story around. A man, called Joe, discovers he has a disease called Huntington’s Disease (HD) and we witness the ramifications that this has upon his family. It is written to be a page-turner and to be gripping, and it is both of these. HD is a rare, hereditary disease where an individual gets passed a faulty chromosome from an affected parent. The mutated chromosome repeats itself resulting in the diagnosis of the disease. Symptoms are cognitive and physical – amongst other things, chorea (dancing, jerky movements), depression, altered mood, impaired reasoning and decision-making abilities. Onset of symptoms is certain, usually beginning between the ages of 35 and 45. Once the symptoms have begun, it is degenerative. I have Huntington’s Disease. I have known since 2000, when I took a test to discover if I was gene positive or negative. I was passed the faulty gene from my father. All decisions that I have taken from that date can be viewed in light of this information. It is a question everyone asks themselves, ‘What am I going to do with my life?’ but when you know that ahead of you, immovable, is a degenerative disease with no cure, it brings everything into focus. What motivates each of us is a fascinating question. My imperative on deciding to become a potter was to be the best possible potter I could be in the shortest possible time. Every hour at the wheel counted. I put myself on the line again and again, applying for opportunities beyond my level of skill or experience. Having not made a ‘success’ of things up to this time, I was determined to have a successful pottery business. So, this last year has been unbelievable for a number of reasons, including four or five wonderful opportunities, all of which came at the beginning of the year, including being commissioned to make a bespoke range of pots, in response to the sculptures of Barbara Hepworth, by Tate Gallery to be sold in the exhibition shop during their summer Hepworth exhibition. As a consequence, it has been a year of hard work and incredibly long hours. This is partly HD related. Maximise the opportunities! I am either outside the boundaries of average age of onset, or approaching it, depending on the measure (45 or 50 years old), I will be 47 in April. I am not special. The symptoms are not going to hold off just because my name is David Worsley. One of the difficulties of the disease is that both the symptoms and the age at which the symptoms begin are unpredictable. They are certain to happen but I don’t know when they will start. It is an incredibly hard thing to live with – and seems to be getting harder. I am someone who tries to find the positive in every situation, even if that optimism is misplaced. With this I am really struggling. An HD veil gets cast over everything. There is no reason at all why the symptoms shouldn’t begin tomorrow/today, or they could begin next year, in two years’, five years’ time. It will be a miracle, though, if I am still making pots in ten years’. But, in the midst of these long hours, my work/life balance has disappeared and I regret this deeply. It is impossible to properly give yourself, as a partner and a father, with the balance that I have been keeping. I have been living a subsistence life, just getting by, just about doing enough. I could not have achieved any more. But this is not acceptable. My family is my heart. Having HD has an effect upon my time with the family, as well. It is incredibly precious time that we won’t get back. My ambition for next year is to bring my work/life balance back to where it should be. The life of a maker is one of hard work and dedication, I don’t think there is another way, but it cannot and must not be all. Earlier this week, Monday, my partner, Claire, and I went on an overnight stay to London. 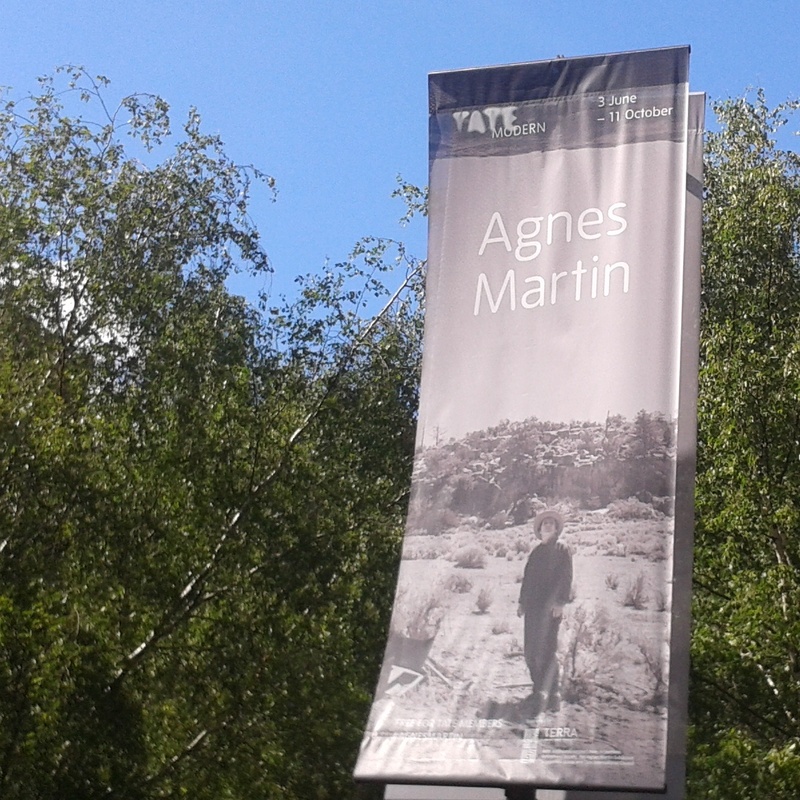 Amongst a few things we wanted to do on the trip was visit the Agnes Martin exhibition, which is currently on at Tate Modern. We have both known of Agnes Martin for sometime, knowing a little of her painting and being especially taken with her writing. It takes a great deal of application to make a composition that is totally acceptable. Beethoven’s symphonies with every note composed represent a titanic human effort. To progress in life you must give up things that you do not like. Give up doing things that you do not like to do. You must find things that you do like. Things that are acceptable to your mind. You can see that you will have to have time to yourself to find out what appeals to your mind. While you go along with others you are not really living your life. To rebel against others is just as futile. You must find your way. Happiness is being on the beam with life – to feel the pull of life. We have, though, been surprised that so few of our friends and acquaintances have heard of her. This under-the-radar profile is mentioned in texts we have read about Martin and the exhibition, and is something that the show is, apparently, hoping to remedy. I am convinced that the curators will succeed in this endeavour. Going round the Martin exhibition is a profoundly moving and visceral experience. Twice before in recent years, Claire and I have been similarly affected. 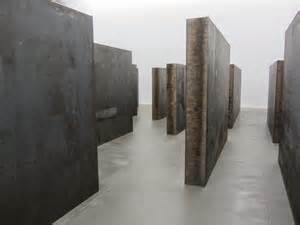 There was the Rothko exhibition, also at Tate Modern, and the Richard Serra, at the Gagosian Gallery. Each of these three shows affected us in some elemental way. They challenged our sense of ourselves as human beings. I had seen a couple of Rothkos and, of course, the posters are everywhere. But I was not prepared to be surrounded by the paintings and to experience them room after room. I had gone to the show reluctantly and without any expectation. I was utterly confounded. Richard Serra I know a lot more about. I studied sculpture and was influenced by his work, and his films, like ‘hand catching lead’ from 1968. His work is masculine and monumental, often massive in scale. But it is the details that are also so powerful. The surfaces of the sculptures, the textures, the colours – the colours in the work called ‘Ramble’ (see image below), from 2014, were just stunning. Each inch of each of these huge steel structures was covered in the most beautiful, vivid array of colours, which must all be the product of the sculpture’s making – from cutting or burnishing or grinding. My favourite was a steely-magenta blue – the colour of a placenta. And the edges of each piece of steel, which at first seem so straight and true are, on closer examination, rough and jagged and altered. These works get you right in the gut. 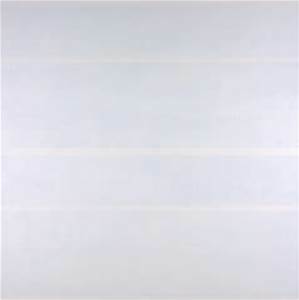 The paintings by Agnes Martin are so different to the works of both Rothko and Serra, and yet the effect is just the same. For most of her working life, for some three decades, she painted within a square canvas of 72 inches by 72 inches. On each and every canvas she drew across the surface soft pencil lines marking out a grid, or series of columns or rows, within which she painted washes of colour. She didn’t deviate from these self-imposed limits. Each room in the exhibition was hung with paintings of the same size and framed in the same narrow steel frames. At first glance, the surface of the paintings hardly varied, nor between paintings; yet, when you got up close, the variations were infinite. The soft, hand-drawn pencil lines contain all the motion of her hand, subtly altering weight and direction. The washes of colour are at times thinly applied and at others built up in layers. The edges abut the pencil lines or the edges of the canvas, or don’t quite, coming up short, or break right through. Some of the grids are made up of tiny dots, some of the rows or columns wider. What was so profoundly moving about the exhibition was that I felt the presence of Agnes Martin so strongly at each painting, in each room. She fills the negative space. You could feel the time taken to complete the works, the fact that she had to return again and again, alone, to each work. She had to stand before each canvas for hours, days, with the same limits in front of her – the same lines, the same grids, the same colours. It is almost monastic. She goes to the well time after time. I found it achingly profound. Each time she went back to the well she drew deeper and deeper. I feel some resonance between the canvas and the wheel-head. The hours spent at the wheel, pulling the same walls, forming the same shapes. Living a vertical life, drawing deeper and deeper. Inspiration for this blog usually comes from books I have been reading. Lately, I have been reading a clutch of books about various aspects of our relationship to the natural world – books by Richard Mabey, Roger Deakin and Robert Macfarlane. 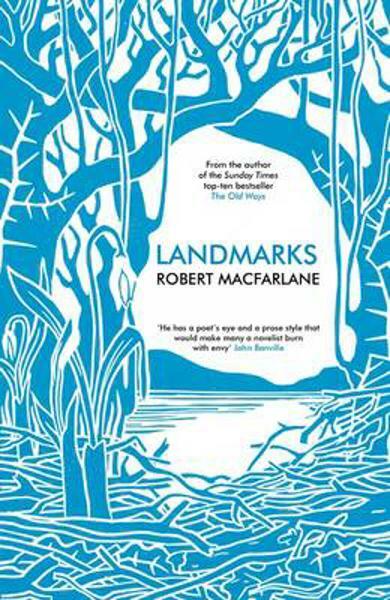 I have written about Robert Macfarlane in a previous post (after reading the wonderful The Old Ways) and was given his newly published Landmarks for my birthday a few weeks ago. 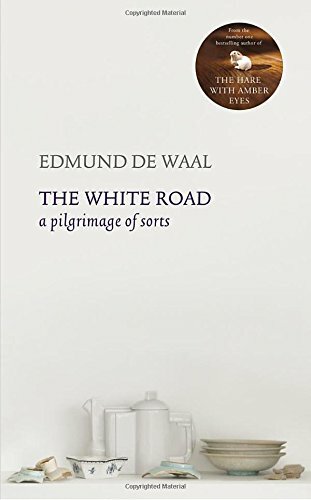 It is another remarkable book – it concerns language, the language of nature and the language of writing. It speaks of language’s power to ‘shape our sense of place’ and ‘is a field guide to the literature I love’. It is also ‘a word-hoard of the astonishing lexis for landscape the exists in the comprision of islands, rivers, strands, fells, lochs, cities, towns, corries, hedgerows, fields, and edgelands uneasily known as the British Isles’. Each chapter covers an aspect of the natural world (mountain, hunting, northlands…) and at the end of each is a glossary of words relating to that subject – landscape, nature or weather – taken from dozens of dialects and languages, that Macfarlane has collected over decades. While reading them, I thought it would be great to do an equivalent glossary for pottery. Touch, the hand, is fundamental to making anything – I have often said that one of the central aspects of a handmade object is the fact that it is a conduit between the hands of the maker and that of the user – a handmade object cannot be understood without the sensation of touch. Touch makes an object present, real, knowable. And its absence, its lack, is a place of mourning. I have become acutely aware of touch as I have got to know my material, clay. I am acutely aware of its absence, too. It was that which I felt most keenly, and still feel, on the death of my brother. I will not again know his physicality, the strength of his body, his skin under my fingers. Touch, and the lack of it, defines our place in the world.